The dish for this week came from another op shop pickup by my dad: "Inspiring Tastes". 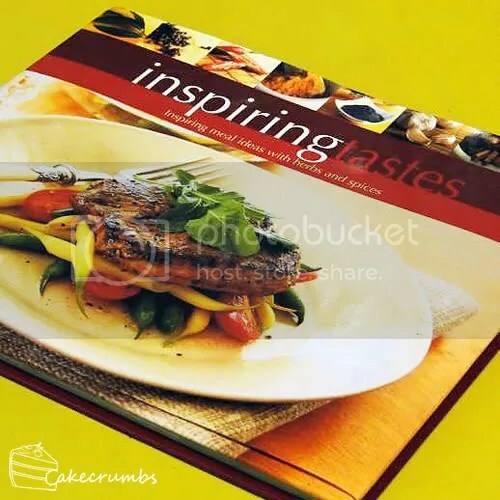 This book is another of those promo dealies, this one by Masterfoods. The theme for this is that every dish uses a Masterfoods product or four. But, despite the fact that I usually do buy Masterfoods products, they can be easily subbed for any brand, or even fresh herbs. Now, lamb is my favourite red meat in the world. In fact, it's my favourite meat period. But it is also one of the most expensive meats going around, so it's seldom had in my household. As a poor uni student, I usually only stock our freezer with chicken, mince and sausages where protein is concerned. So this dish was a bit of a special treat. 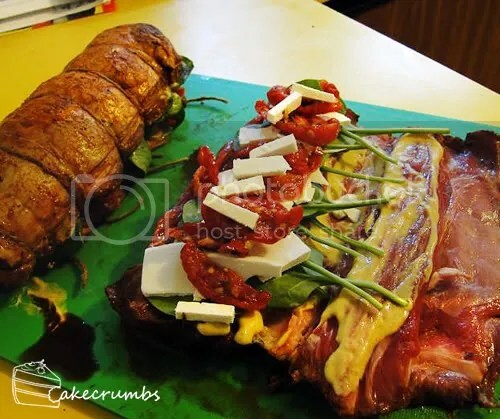 The loin is coated with mustard and stuffed with baby spinach, feta cheese and sun dried tomatoes. I don't even like tomatoes, but these I find rather nice baked. Once you've roasted your meat you'll have a lovely looking lamb with a yummy herb crust on top. Time to carve it up! 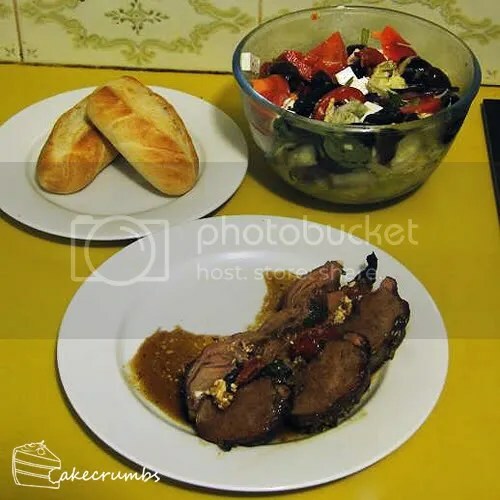 Last night turned out to be surprisingly hot (mostly because we've not hit summer and have yet to get used to 30°C days being "cool"), so I served the lamb with salad and dinner rolls instead, which made for a lighter, more refreshing option. 2. Place the lamb loins flat on a board. Spread each loin with Dijon mustard. Arrange spinach leaves, sundried tomatoes and feta cheese evenly on the inside of each loin. Season with salt and pepper. Tie the lamb up with string. 3. Combine the olive oil, garlic and rosemary. Brush the mixture over the lamb loins. 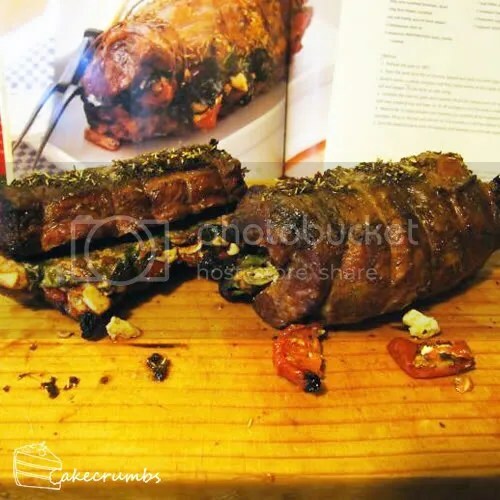 Place on a rack over a baking tray and bake for 30-40 minutes, or until lamb is cooked to your liking. 4. Meanwhile, to make balsamic and rosemary jus, combine all the ingredients in a small saucepan. Bring to the boil and simmer for 5-6 minutes or until mixture has reduced. 5. 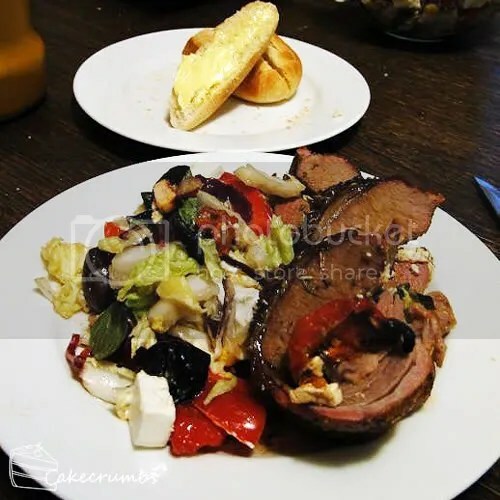 Slice the lamb and serve with the balsamic and rosemary jus and roast vegetables.